Go easy on me, will you?! Yoko: Move your arms more. Raise your things. Keep your rtythm! Mimiko: Go easy on me, will you?! 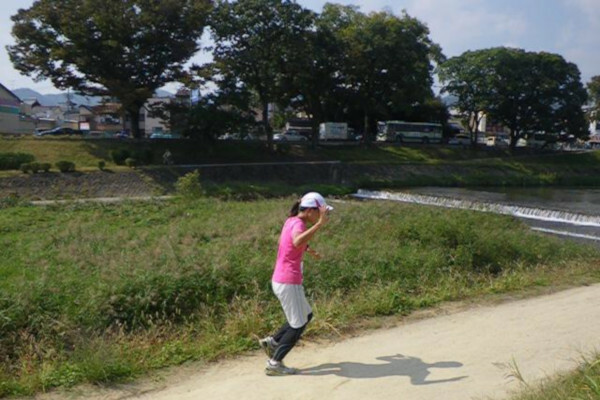 Yoko: If you want to run in the fall marathon, you'll have to train hard for it. Yoko: Look, the mayor has brought someone to Sakurayama. Yoko: What? Do you know him? Mimiko: Aoki Ryuji. He's the president of a famous recreational development company. People call him "Blue Dragon." Yoko: That's the cute name. Mimiko: Um...the blue comes from the blue fire that he breathes on his competition. Yoko: He looks nice, though. Mimiko: I wonder what he is doing here. I have a bad feeling about this. Q: What will Mimiko need to do if she wants to run in the fall marathon? A: Train hard for it. ◆ I wonder what I can do for her now. ◆ I wonder how long this heat will last. （解答) I wonder what he will do next.